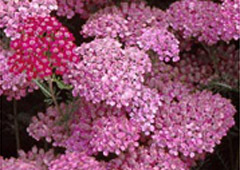 A range of flower colors, fine-textured foliage and medium height make this drought-resistant medicinal herb an easy, attractive, fragrant and drought-resistant addition to border plantings. Prefers a light, well-drained soil. Some varieties also produce gold flowers. Can vary from grey-green to dark green. non-invasive - Is naturalized in many areas. fragrant - Foliage is highly aromatic, resembling chamomile. dried flowers - Dried flowers tend to loose their color. Propagate by seed, division or separation - New seedlings or divisions should be planted one foot apart. In the spring, clumps of mature plants should be divided as they become crowded. It will take seedlings one to two years to establish themselves. 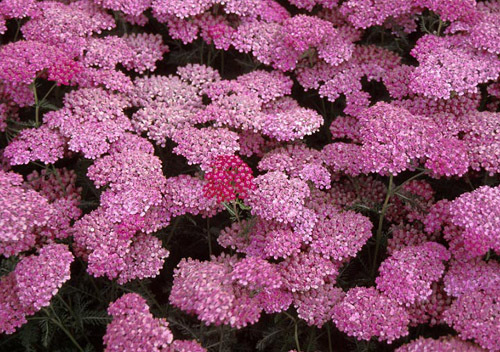 Yarrow is drought resistant and so doesn't need frequent watering. Tall plants may need staking. Plants are much more susceptible to diseases in humid areas. Mildew: If infection is severe, cut and destroy plants. 'Rosea' and 'Rubra' are redish varieties but many cultivars are available in a wide range of colors: white, pink, violet, yellow, gold, red.